Ning Wang is the new chief executive officer of Offensive Security, a cybersecurity training business best known for its popular certification programs which teach technical skills to hackers and test their chops. The company is also known for developing Kali Linux, an open source toolset used by penetration testers the world over. Wang, who holds a Ph.D in physics from the University of California, Berkeley, began her career at the consulting firm McKinsey & Company as part of the same class as Facebook’s Sheryl Sandberg in the 1990s. She later rose to a variety of c-suite roles at multiple technology companies, including finance and operations chief of Lynda.com (now known as Microsoft’s LinkedIn Learning); chief finance officer of Eucalyptus, a cloud software-maker (now owned by HPE); and most recently as second-in-command of HackerOne, a bug bounty startup. Wang joined Offensive Security as an independent board director in September after the company took its first venture capital investment from Spectrum Equity, a Boston-based firm. The terms of the deal were not disclosed. On Jan. 3, Wang replaced Joe Steinbach, the company’s former CEO of four years, who ran the business out of the Philippines. He departed in October to consult and advise startups. Expertise is unevenly distributed within the information security industry, Wang told Fortune on a call. In the three years she spent at HackerOne, Wang discerned an extensive skills gap. Corporations are indeed hungry for hacking talent. CyberSeek, a job-tracking project sponsored by an education initiative within the U.S. Department of Commerce, estimates the current number of unfilled cybersecurity jobs at greater than 300,000. Perhaps ironically, Offensive Security had the exact opposite problem. Already replete with hacking talent and set on training the next generation of computer crackers, what the company needed was business savvy, said Jim O’Gorman, the company’s chief strategy officer. O’Gorman, who joined Offensive Security after becoming enamored with its products as an early user, explains that this desire to get ahead was part of the rationale behind the company seeking outside investment. “Everyone in the organization was security nerds—we didn’t really have a business background whatsoever,” O’Gorman said of the early days. When growth “hit a plateau,” he said, it became “obvious” the team needed new and different talent. Now that Wang is in charge, she has her sights set on expansion. Offensive Security has already managed to attract big customers—including Cisco, Wells Fargo, Booz Allen Hamilton, and some defense-related U.S. government agencies—on the basis of reputation alone. The company built its following through word-of-mouth and in-person training sessions at the annual Black Hat hacker conference in Las Vegas. 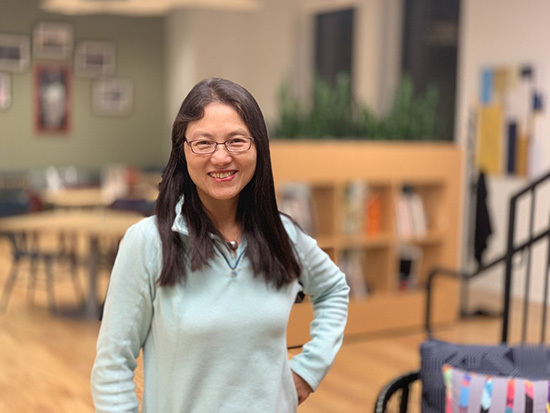 Wang said she plans to develop subscriptions and a continuing education business while keeping core components of the brand, like the pen-tester toolset Kali, free. One of her top priorities will be to create more business-to-business offerings, a product line she built out to great success at Lynda.com. Since then, Wang has helped Mårten Mickos, CEO of HackerOne and former CEO of Eucalyptus, build two companies. In her most recent stint at HackerOne, she helped the company grow revenues by an order of magnitude, she said.